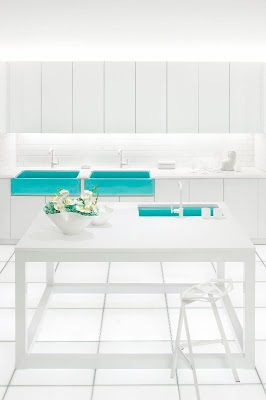 Kohler's rolling out four, new and vibrant colors with the help of Jonathan Adler. 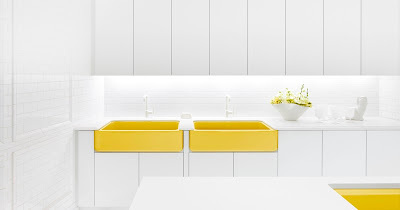 Say what you will about Adler, but I give him all kinds of credit for bringing vibrant color to six, select kitchen and bath sinks from Kohler's existing collections. These Jonathan Adler colors are only available in enameled iron because the degree of saturation shown in these sinks can only be achieved with enamel. The sinks available in these colors are Tides, Canvas, DemiLav Wading Pool for the bath and Whitehaven, Riverby and Iron/ Tones for the kitchen. These sinks are cast in the Kohler foundry in Kohler, WI and carry a lifetime warranty. There was once a time when I lived to take potshots at Adler's work. While it's true that his creations aren't for everybody, what's also true is that he's a fundamentally decent man who understands his audience perfectly. 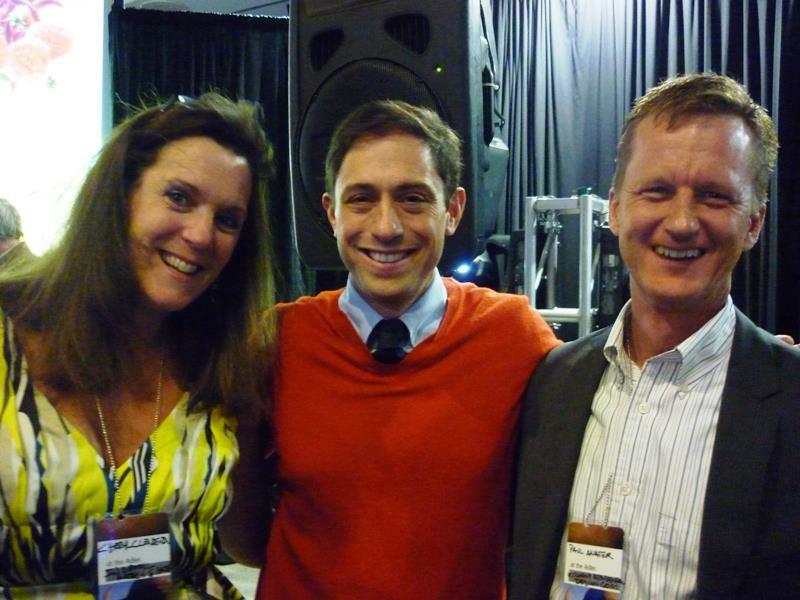 Besides, anyone who'll pose with the likes of these two can't be anything but a good guy. Right Cheryl? So what do you think? 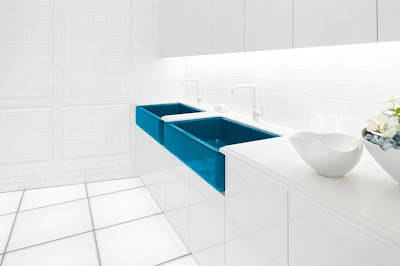 Is there room for this kind of bold color in a sink? Would you ever use color this way in your own home? Right Paul!! And there is a place for these colors however I think perhaps a second home, vacation home etc. I always say ( and Tim apparently quotes me on this!) 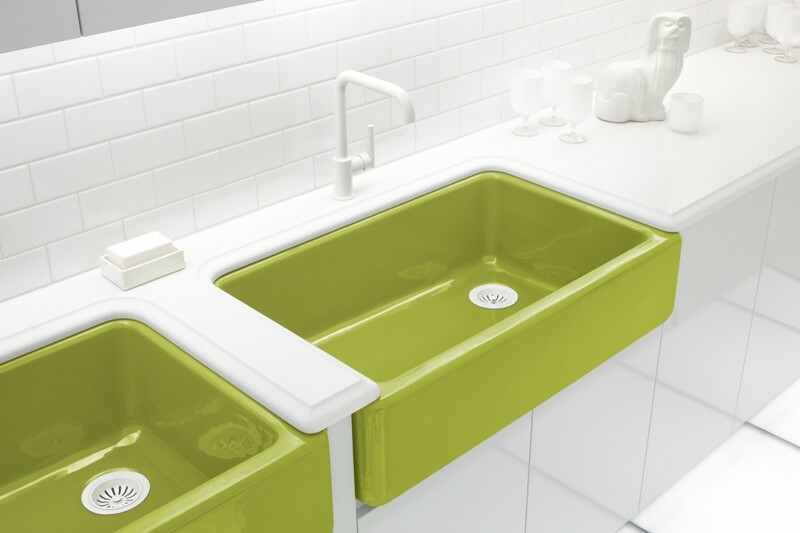 buy the best sink you can afford. This is because you will not easily be able to replace it of us undermounted. Soooo as much as I love all the above colors, I think is trendy in a way that could be limiting. Much akin to harvest gold and avocado green. My two cents! Actually Cheryl, I was just looking for an excuse to run that photo of the three of us again! Paul, you brilliantly just added the Greenwich Green kitchen sink to my imaginary dream home. Aren't you the cutest trio. :) Do love the colour palette! That night was a lot of fun!